Joseph Levis Worrall first attended the Old Eagle School in 1826, when he was nine years old. This was several years after Margaret Cornog, whose experiences in the school were related in last week’s column, went to classes there. Two of their teachers were the same, Adam Siter and George W. Lewis. Two others whom Mr. Worrall recalled when he was writing his reminiscences in 1900 for “The Suburban” were Thomas Ward and Calvin James. After a year or two of early schooling he left, returning again in 1832 to remain for two years. This was when he was an apprentice in Philadelphia, and later at Mark Brooks’, near Radnor Station. In April, 1839, he came to live in a house in Radnor, which his father had purchased from Edward Siter. Here he was still living some 61 years later, when he wrote his boyhood reminiscences. By the time Joseph Worrall came to the school, there was an interesting innovation in the interior arrangement from the period when Margaret Cornog was a pupil there. This was a board partition through the school house, with the north end for the girls and the south end for the boys. The teacher sat in the girls’ end, close to the partition by the window without glass in it. Thus he could keep a sharp eye on the boys also. “When we recited”, Mr Worrall writes, “we came through a door in the partition and lined up along the partition while we said our lessons, moving from tail to head as we answered right or wrong. We had as many as 70 girls and boys in the school, but not generally over 40. Among the pupils were a number of apprentice boys sent there by John Meredith, a builder in the neighborhood, at that time employing as many as 120 men at a time. In winter he has a sash and door factory close to where Lobb’s ‘board yard’ was later located. Until the school law came into effect, tuition for those whose families could afford it was $2 a quarter. This, however, did not include books, paper, or quills for pens. If, however, parents were too poor to pay for schooling, a justice of the peace could give a certificate to that effect. This was handed to the teacher when the child was admitted. The expense was charged to the director of the poor, who in turn charged that amount to the Township. During the winter of 1832, a noteworthy event took place in the Eagle School, when an exhibition of the telegraph was given there one evening. Permission for the exhibition was obtained in advance from Edward Siter, who at that time was proprietor of the Spread Eagle Inn. The exhibition was to be a free one, the ultimate object of which was to obtain an appropriation from the Pennsylvania Legislature, if reports on the exhibition were favorable. In order to spread the news of such an important event as this, Edward Siter went around on horseback to different stores, blacksmith shops and taverns with information about it. He also put a notice in the “Upland Union”, the Delaware County newspaper of which Alex McKeever was editor, and in the “Village Record”, Chester County’s publication. When the eventful evening arrived the crowd was so large that many could not even get into the school building. “Dr. Joseph Blackfan and my father, Fred Worrall,” Mr Worrall writes, “were chosen by the people to sit by each telegraph operator, who took their positions at opposite corners of the room. Edward Siter, John Pugh and others stood in the door of the board partition as judges, to see that no sign was given of what was written, and then a message was sent across, the machine writing by dots and dashes on paper. “Dr. Blackfan wrote down a message which his operator sent to the man at father’s end, who read it out loud, and then a message was sent back. The judges were first given the message Dr. Blackfan wrote down to see that no fraud was practiced. The message was always read off correctly, and the effect on the audience was astonishing. They carefully inquired of Dr. Blackfan and father to know if there was any collusion. Father and many others thought the exhibition was of supernatural powers. Edward Siter stated that he could not account for it. Others thought it was the work of the devil. Whether the success of this meeting had the desired result of obtaining an appropriation from the Pennsylvania Legislature is not recorded in Mr. Worrall’s reminiscences. However, he does go on to say that, by special request, the exhibition was repeated at the schoolhouse at old Radnor Church, as well as at Friends Meeting School and at John Evans’ schoolhouse, south of Radnor Friends Meeting. Another event of tremendous interest followed this meeting, when it was found that the Philadelphia and Columbia Railroad would lay its tracks almost within sight of the old Eagle School. In January, 1900 “The Suburban” started a column of “Historical Notes”, which had a prominent place on the front page. Just how long the series continued, this writer does not know. However, there are three clippings from this column among the many interesting ones to be found in the old Martin family Bible, to which we referred last week. The first sketch was written by a member of the family well known in this section for many years, Joseph Levis Worrall, who was born in April, 1817. Another writer came from a family equally well known locally then and now, Margaret Cornog, born in October, 1810, who must have been ninety years old when her reminiscences appeared in 1900. Still a third writer was Joseph Fisher Mullen, then of Upper Merion township, who had been born in March, 1824, in Downingtown. All three writers had one thing in common. Each had attended Old Eagle School which, in its restored condition, still stands on Old Eagle School road in Strafford. The ground on which the school was built formed part of an original grant by William Penn to Richard Hunt, of Brome Yard, Hereford County, Wales. This grant was dated March, 1683. By the time Jacob Sharraden purchased the 150 acres in 1765, it had become the property of Sampson Davis and his wife. In 1767, Sharraden deeded this property to his son-in-law, Christian Werkhizer. However, on the tax lists of Tredyffrin for 1768, Werkhizer is taxed for only 149 acres. This discrepancy lends credence to the belief that somewhere between 1765 and 1768 Sharraden had donated one acre of his holdings as a site for a German Protestant Church and School. When small Margaret Cornog was eight years old in 1818 she began to attend the Old Eagle School, and here she remained for several years. “Because I studied hard and liked to do my lessons, I was never slapped or punished in that school” this 90-year old woman wrote in 1900. “However, the ‘birch’ was not spared in those days,” she continued. “The teacher, who was called the ‘master’, used to walk around the room, and if a child was not doing right he would give a cut with the switch. I have often seen children sent out to cut switches with which they were to be punished. The boys had a way of giving the switch they were obtaining a cut with their knives so that they would not last for more than a few strokes. In those days the school room was heated by a “ten plate stove” which stood in front of the chimney place. A bucket of water for drinking purposes was kept on a jamb which was almost as high as the small Margaret’s head. Benches were arranged around the walls of the building, with shorter ones in the center for small children. For writing they used quill pens, which they made themselves. Three dollars per quarter was the tuition for pupils at that time. Thus ended the reminiscences of a woman who at the age of 90 years must have been a remarkable person, with her keen memory of days long past, and with a gift for telling of these days. Subsequent articles in this series will tell of Mr. Worrall’s school days in the Old Eagle School, as well as those of Mr. Mullen. The large, well-worn family Bible of the Martin family, which was lent to this writer by Mrs. Emily Siter Wellcome in order that the history of original members of the family, who owned Martin’s Dam, might be traced back to England, was a repository of various newspaper clippings, several dating back almost sixty years, others not so old. Among these are several issues of “The Suburban” containing a column headed “Historical Notes” with the sub-heading “Reminiscences of the Neighborhood of Wayne and Strafford in the Early Part of the Last Century”. This would give evidence that more than half a century ago “Your Town and My Town” had a predecessor in “The Suburban”. Mrs. Wellcome explained that these particular clippings were of sufficient interest to form part of the Martin family history, since her mother, Miss Sally Martin, married William Siter, one of the two hosts at the famous fox hunt of which we are writing. The livery stable of Siter and Barrett was located slightly to the rear of the present Buick agency building. It later became the Kromer livery stables. A vivid description of subsequent events then follows. “Twenty minutes later”, according to “The Bulletin”, “the blast of a bugle rang out merrily on the morning air. In an instant came the answer from the seven packs of hounds fastened up in the stable. It was one joyous yelp. At the same moment the doors were thrown open and away they dashed across the pike to find the scent. No time was lost. A young English hound imported by Charles E. Mather for the Radnor Hunt Club gave lip, and away it sped in the direction the fox had gone, followed by the combined packs. The chase that followed was a memorable one in the annals of “that far-famed fox-hunting country around Wayne.” It was, however, a brief one, since it was only 45 minutes after the fox was liberated that it was run to earth within three miles of the starting point, on the farm of Mrs. Ramsey, and just at the back of St. David’s Church. The chase had led over the farms of Joseph Childs and Thomas Watson to Newtown Square, after which it circled back toward Wayne. Brief in time though it was, this chase was still a good one while it lasted, according top our “Bulletin” reporter. The latter describes it as “much faster than the ordinary Pennsylvania fox hunt… it partook of the character of a Melton Mobray Meteon, one of those swift Lancastershire hunts in England that try the mettle of man and horse… The country over which the fox made his tortuous course was well calculated to arouse the fearless instincts of the followers oi the chase. The honor of being first at the finish fell to John Torpey, of Radnor, who was mounted on “Plunger”. Secvond to reach the scene was Master Billy Holloway, of Wayne, on his imported Irish pony, “Connemarra”. Among other well mounted riders were Lemuel Altemus on “alonzo”, David Stevenson on the imported Canadian hunter, “Gold Blade”; Edward Crozer on “Peter” and Frank Barrett on his bay mare, “Aggie”. John Mather, of Wayne, was master of the hounds. Among the several hundred participants and spectators of the hunt were many well known in Wayne, among them Dr. and Mrs. Joseph Egbert, Dr. and Mrs. C.W. Smedley, Mr. and Mrs. I. Walter Conner, Mr. and Mrs. Frank Smith, Mr. and Mrs. William Siter, Penn Smith, Henderson Supplee; John, Mason and Nathan Pechin’ Frank Barrett, Thomas Fleming, Christopher Downes, D.B. Turner, Samuel Altemus, H.B. Hare, William Rowan, Paul Lamorelle, Mr. and Mrs. Frank Dallett, Andrew Sellers, Harry Childs, Joseph Childs and Joseph Childs, Jr., Millord Pugh and many others. Still others came from as far away as New York, while more nearby localities such as Philadelphia, Phoenixville, Duffryn Mawr, Gulph Mills, Devon, Media, Berwyn and Merion Square were well represented. December 21, 1897, must indeed have been a gala occasion in Wayne! “Wayne’s most modern building”, as the Colonial Building has been called in advertisements pertaining to office space therein, is in reality one of Wayne’s oldest edifices. Lyceum Hall, a small, square building erected on the northeast corner of Lancaster avenue and North Wayne avenue in 1871, forms the nucleus of this structure. J. Henry Askin, one of the founders of Wayne, whose original home was “Louella House”, now the Louella Apartments, donated the ground on which the Lyceum was built. The original Wayne Lyceum Hall as it appeared in the middle eighties. On the near corner is the drugstore of J.M. Fronefield, Jr., with Mr. Fronefield himself standing on the steps. When the building was dedicated on October 24, 1871, Mr. Askin was the first speaker on a program which marked a great occasion in the history of early Wayne. More than 500 men, women and children filled to overflowing the large hall on the second floor. The weekly “Wayne Gazette”, in describing the occasion, stated that “we certainly must not be considered egotistical in saying that the dedication of Wayne Lyceum Hall was most successful. We doubt if an audience larger in members or one so highly intelligent has assembled in any public hall in Delaware or Chester county on any occasion”. 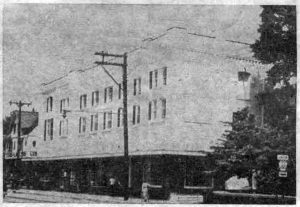 The building was described as “built of brick, rough cast in imitation of granite, three stories high… The first floor contains two large stores each 20 by 40 feet, and an office of the same size. The other room on the same floor, which is the reading and library room of the Lyceum, is 55 by 40 feet. It has a gallery and stage with rooms for the president and secretary… The third floor is being finished as a Masonic Hall and is intended to be used for a new Masonic Lodge”. This was the first home of Wayne Lodge 581, F. and A.M. In 1889 the Wayne Estate enlarged the store, adding a new proscenium and scene shifts. 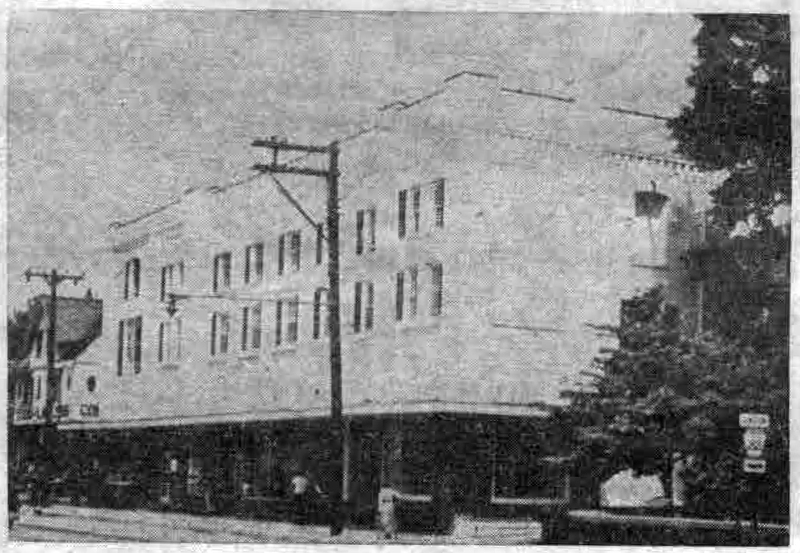 Then again, in 1903, the building was remodeled and enlarged, provision being made at that time for the housing of the Wayne Post Office. Thereafter it became the center of community activities for Wayne, with the European concerts and other events of social and musical interest being given there. 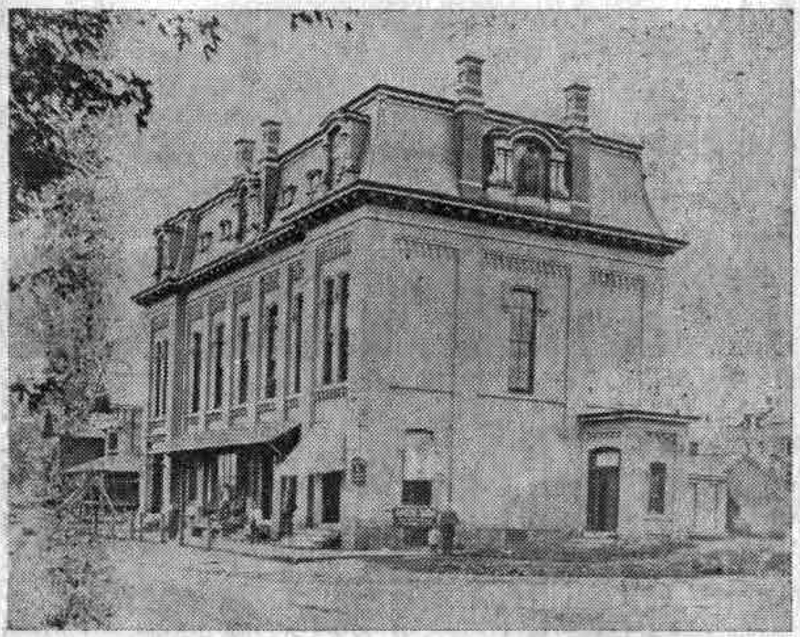 The Opera House, as it was called by this time, rented space to the first motion picture theater in Wayne, which was run by the Messrs. Allen. 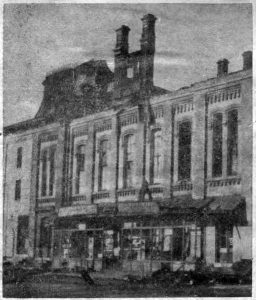 In the early morning hours of December 30, 1914, the worst fire that Wayne had experienced since the old Bellevue Hotel burned to the ground in March, 1900, partially destroyed the Opera House. Starting in the office of the Counties Gas and Electric Company on the west side of the building, the fire spread rapidly to the Post Office and to the Welsh and Park Hardware store, as well as to the Auditorium, the Wayne Plumbing and Heating Company office, the Wendell and Treat office, and the quarters of the Wayne Lodge. The Radnor Fire Company had but two engines at that time. However, reinforcements arrived on the scene so speedily that eight streams of water were soon playing on the fire. 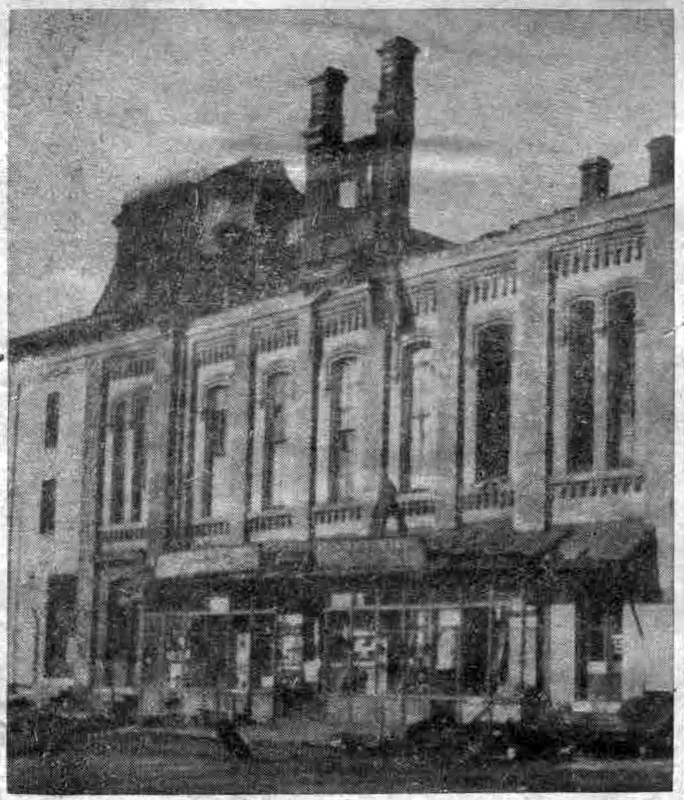 Havoc wrought by the fire as seen from the North Wayne side, showing the Post Office quarters and the counties Gas and Electric Company office, where the fire started. 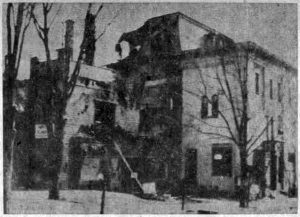 The losses of the tenants in the building mounted into many thousands of dollars, in addition to the losses suffered by the owners of the Opera House. However, within a comparatively short time the extensive repairs were completed and tenants returned to their former quarters. After the completion of these repairs the appearance of the Opera House was very much as it remained up to the time of the extensive alterations made in 1950-51 by Main Line Investments, Inc. 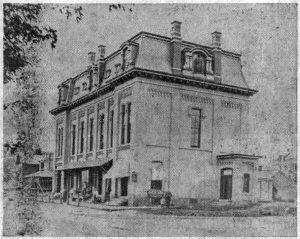 The Opera House as it appeared after it was rebuilt in 1915, and as it remained until its recent renovations by its new owners, Main Line Investments, Inc., in 1950-51. 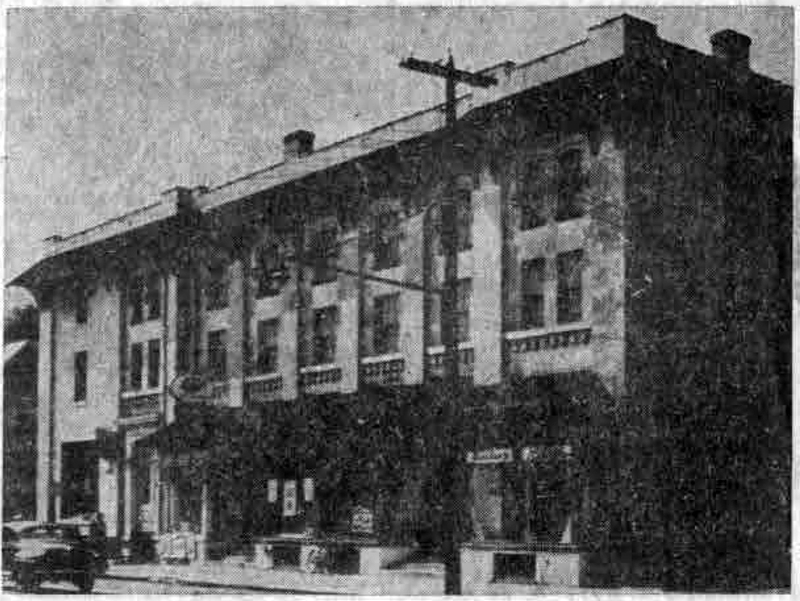 As the Opera House looked from the Lancaster avenue side on the morning of December 30, 1914, with Welsh and Park’s Hardware Store in the center of the building. The Colonial Building as it appears today, with its spacious ground floor shops and its many offices on the second and third floors.